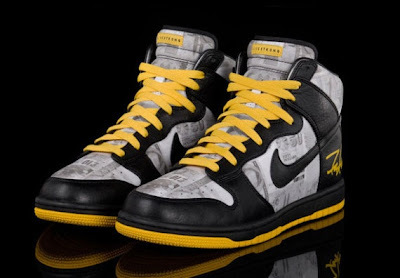 Inspired by the holy grail of all sneakers, the Nike Dunk Hi Flom, the LIVESTRONG limited edition sports a colorless money print upper with yellow/black/white. 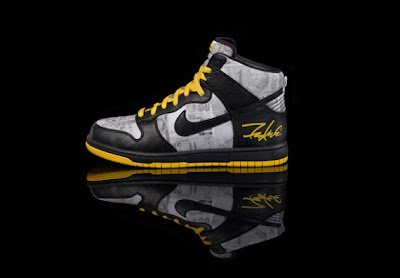 Its due to be released Saturday, July 18 for $150 USD. As with all LIVESTRONG products, all proceeds will go to the Lance Armstrong Foundation for Cancer Research. Folks, this sneaker is serious business, so if you intend to get a pair, don't expect to get it without a fight!